I was recently fortunate enough to be able to read Irredeemable in it’s entirety and I cannot believe I didn’t catch this title beforehand. I’ve been a fan of Mark Waid’s work after I read Kingdom Come and his run on JLA and Irredeemable didn’t disappoint. It’s tell the story of a superhero, Plutonian, that snapped and became a supervillain and all the fallout that comes with that. The story recently focused on a chance the Plutonian may have to reverse his past crimes. He was training with Qubit trying to learn to better use his powers until he realizes that his arch-nemesis Modeus has possessed the body of the woman he’s infatuated with, Bette. While Gilgamos, Kaidan, and Scylla have harvested seeds from the Tree of Life in order to protect everyone from radiation sickness. I have really enjoyed the story to this point. The characters are well written and the story is gripping. Will Plutonian find redemption? I’m interested to see how all this plays out. Since Modeus has taken over Bette’s body he’s able to give her a boost of power, enough to go toe-to-toe with Plutonian. But, what is the end game to their power struggle? The art is so-so, at times it looks really polished and well done and at other times it just looks wonky. The faces especially suffer from this, from one moment to the next the faces look so similar it’s difficult to tell the characters apart aside from their clothing. But, other times details are really refined and look great. Although, the fight scene between Plutonian and Bette looks awesome. 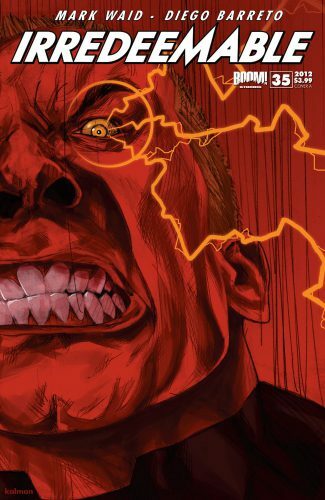 If you’ve been reading Irredeemable then you definitely need to pick this issue up so you can see how this whole story ends. Waid has announced that it is going to end May of this year. However, if you haven’t read this title then you would probably be lost during the issue, it’s not really a story you can jump into.